Clean, wash and soak the four daals for 4-5 hours. Grind the daals, without using water (for you need a dough like consistency). The texture should be a bit grainy. Mix in rest of the dry ingredients and shape the dough into slightly flat rounds 2-3 inch (6 cm) in diameter. Heat the oil and over high heat, put in as many balls as come in without touching, turn after about 10 seconds, and lower the heat. Cook till firm on both sides, but not brown. When cool, slice into 1/2 inch (6 cm) thick slices. Before serving, deep-fry the slices, first over high heat then lowering the heat till crisp. 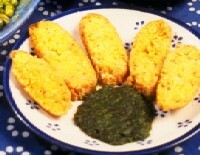 Serve with Hari Chutney.